What is a Mobile Home Tub Trap? A mobile home drain trap is a special fitting that has a number of applications. In a mobile home, there may not be enough room underneath a bathtub to allow for the normal P-trap drain fitting that you would find extending down below the floor level in a site-built home. Usually, this kind of trap is found in bathtubs with no overflow opening. While in traditional bathtubs, clogs are removed by snaking down through the overflow fitting, with a mobile home drain trap it is necessary to remove the trap to unclog the drain. 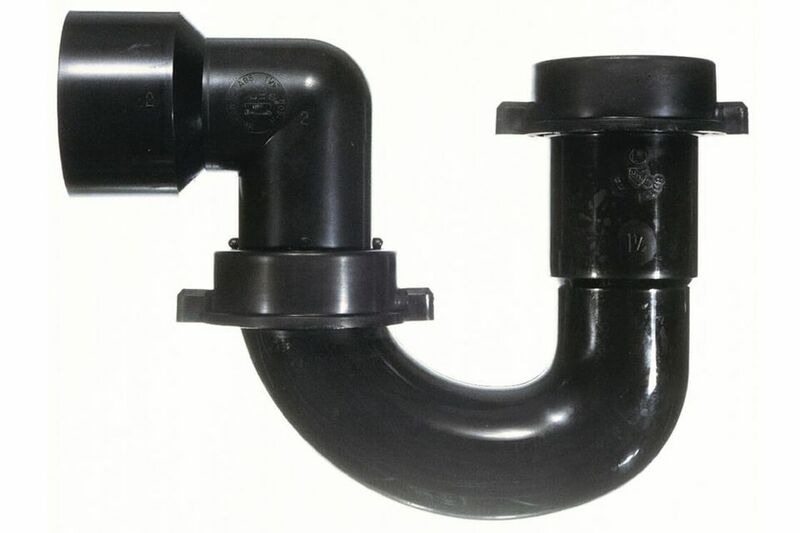 A mobile home tub trap is a double-nut trap with a flange on the end of it so it can be removed if necessary. This allows for the drain to sit just below the tub behind the skirting, instead of dropping below floor level as a normal trap does. This makes the design ideal for the limited space in a mobile home or RV, though it also has applications in a standard home. When should I use a mobile home tub trap? This type of trap can be used as a replacement for an existing double-nut trap with a flange. But if possible, it is a good idea to convert it to a normal bathtub configuration featuring an overflow tube and trap; it will not only drain better but also provide overflow protection. Also, the overflow acts as a cleanout and makes it easier to snake the tub drain to remove hair and build-up. On garden tubs, which are wider than standard tubs, sometimes it is necessary to install a mobile home trap to save space and prevent extra work. And in a mobile home, crossbeams and other wood or metal below the tub may not allow for a standard tub waste and overflow, so here a mobile home trap is the best option. When do I replace a mobile home tub trap? There are some instances when changing the trap is necessary. It is a good idea to change the trap if it is leaking or broken. If you suspect a leak, check for moisture in the crawl space under the tub (get some measurements and maybe a picture of the drain configuration while you are down there). Another good time to change the tub trap is when replacing the tub. Installing a new trap whenever a bathtub is installed is always good practice. How do I remove something stuck in the tub trap? Mobile home tub traps usually have two nuts–one in the center of the trap coming off of the trap arm and the other coming off the flanged piece near the highest point of the trap. Loosen both of these nuts, pull down and wiggle the trap, and it should come loose. Have a pan or bucket ready: there will be water in the bend in trap piece, and you'll need a place to catch it. When re-installing the trap, use some plastic-safe pipe joint compound on the joints where the two trap pieces seal. Where can these mobile home tub traps be found? As with other replacement tub traps, these traps can be found at your local home improvement or hardware store. To save yourself some time, call ahead and ask for a stock check in the plumbing department. You can also easily find these online by searching for mobile home tub trap. Sometimes they are sold as part of a kit that includes both the trap and a mobile home drain fitting. Because these traps are also used in RVs, RV supply stores also carry this type of drain trap.